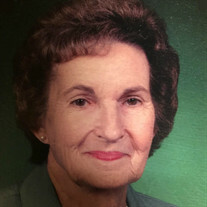 Letha Edenfield Rucker died February 13, 2018 at North Florida Regional Medical Center after a two-month illness. Mrs. Rucker was born in Shaw's Still, FL, February 15, 1930 to Johnnie J. Edenfield and Vila Walker Edenfield. When Mrs. Rucker first started working, she was a telephone operator. She was a secretary for the Florida Road Department, the First Baptist Church of Lake Butler and the Bradford Union Guidance Clinic. She also spent many years as a homemaker. She is survived by her husband of 58 years, Seabie P. Rucker; one child, Paula Elaine Kiger (Wayne) of Tallahassee, FL; and two grandchildren, Tenley Kiger and Wayne Kevin Kiger. She is also survived by a sister, Faye Drew of Lakeland, FL. She was predeceased by an infant son, Paul Kevin Rucker and sister, Ida Lee Tyson. Her quiet intellect infused everything she did, eclipsed only by her kindness. The world is full of impatient and entitled people; she provided a counterpoint by simply being herself. She treasured her family, loving them selflessly. Friends and relatives who prefer an alternative to flowers are encouraged to donate to Florida Baptist Children's Homes (www.fbchomes.org) or St. Jude Children's Research Hospital (https://www.stjude.org).